The technological part reacts to the visitor’s behavior, his path and his stop points in space. The installation includes a system of cameras and projectors as well as an invisible separation of the areas of the gallery. These are the ‘information’ areas, which enable the projection system each time a visitor walks into them. The new proposal has three steps. The first step is when a new visitor enters the gallery. From the technological part, the system recognizes him through the cameras and automatically produces his isovist field for each of his positions. The visitor makes his own choices as he moves in the gallery. When he enters into an ‘information’ area, projections are triggered, providing him with information about the specific exhibit he is approaching. Projections include both animations and texts on the actual exhibit and on the background wall. 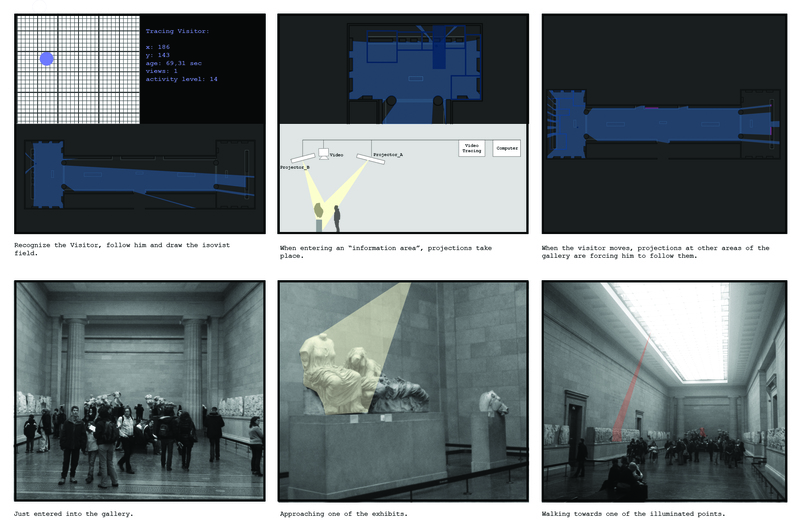 When the projection is concluded, or when the visitor moves away from that ‘information’ area, projections in a distance from his current position are enabled, always within his isovist field, in some thematic succession. These projections aim at making the visitor walk around and enter another information area. In the case of multiple visitors examining the same exhibit at the same time, the projections will turn off when the last individual walks out of the projection area. Some limits to crowding will obviously have to be observed to avoid continuous projections.